Open bag or can. Scoop food. Drop food into bowl. Sounds like a typical meal, right? Open bag or can. Scoop food. Drop food into bowl. Sounds like a typical meal, right? But, did you know that there are other ways to feed your cat or dog that you both might enjoy? Meals and treat times are special moments to bond and interact with your pet. And, they’re made even better when you indulge your pet with nutritious foods they love, like Tiki Pets™! When the next meal or treat time comes around, consider going beyond the standard scoop-and-go routine with one of these ideas. A little messy? Sometimes. Adorable? Always. Hand-feeding your cat or dog is a great way to give them some extra love. It’s also excellent for slowing down speedy eaters (gobbling up food too fast can cause serious problems, like choking or bloating from swallowing too much air). First, measure out the appropriate portion of food according to the feeding guidelines on the package. Then, feed the kibble with your hand, little by little. 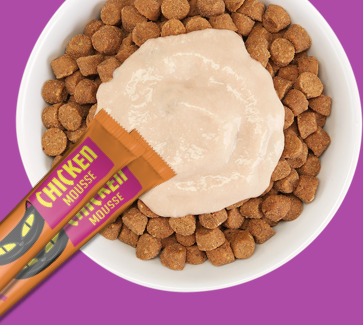 Wet food and treats can be served by hand too – with a spoon or directly from the pouch, like Tiki Cat® Stix™! Dogs and cats are natural hunters, so why not let them hunt for their food? Hide treats or portions of kibble in different areas, and watch your pets use their sensitive sniffers to find them. Just don’t forget where you hid them! Our mantra: boring has no place in their bowls! Amp up meal time excitement by treating your pet to different flavors and textures. Enhance dry kibble with wet food or a gravy topper, like Tiki Dog™ Aloha Petites™ Flavor Boosters, or sprinkle some dry treats, like Tiki Cat® Dash™ dehydrated fish flakes, on top of wet food. What’s better than a toy? A toy with food inside! Fill a rubber toy with treats, dry or wet food, and watch your pet have a ball getting it out. Turn meal time into training time! Use their food as rewards as you teach them how to sit, stay, fetch you a hot date for Saturday night, whatever. Positive reinforcement has never been so delicious. Now, go forth and enjoy meal time with your pet. Happy feeding!